Our newest exhibition, Kaiju vs Heroes: Mark Nagata’s Journey through the World of Japanese Toys opens on Saturday, September 15 and showcases hundreds of dazzling vintage and contemporary Japanese vinyl toys, providing a feast for the eyes and the imagination! Kaiju translates to “strange creature” in English but has come to mean “monster” or “giant monster” referring to the creatures that inhabited the postwar movie and television screens of Japan. The advent of these monsters brought about the creation of characters to combat them—hence the emergence of pop-culture heroes like Ultraman and Kamen Rider. Drawing from the extensive vinyl toy collection of Mark Nagata, the exhibition also demonstrates how Nagata’s pursuit of these Japanese toys took him on an unexpected journey that brought new realizations about his cultural identity as an American of Japanese ancestry. Growing up in California, Mark Nagata was a fan of Disneyland, comic books, and classic Japanese television shows, movies, and toys. These influences inspired his creativity and spurred his initial interest in drawing and art. After attending the Academy of Art College in San Francisco during the late 1980s, Nagata embarked on a 10-year-plus journey as a freelance commercial illustrator. In 2001, Mark transitioned from illustration to co-founding Super 7 magazine, a publication dedicated to vintage and art vinyl toys. Through his work on the magazine, Nagata combined his passion for Japanese vinyl toys with his artwork. It was during this period that Nagata founded the Max Toy Company in 2005 to produce vinyl kaiju and hero toys. Fast-forward to today, and not much has changed for this toy designer, painter, illustrator, and collector. We caught up with Nagata via email to ask him a few questions. JANM: What is your favorite kaiju toy of all time? Mark Nagata: To be honest, my favorite kaiju toy is actually a hero toy. It’s an Ultraman figure, made of soft red vinyl, produced by a Japanese company called Bullmark in the 1970s. Ultraman is my favorite hero and when I discovered that there was a very rare variation of this figure, the hunt was on. During one of my trips to Tokyo in search of toys, I actually found one but the price was very expensive. Even though my fellow toy friends were willing to let me borrow the money, sadly I had to pass on the chance to obtain it. For the next month after returning home, I couldn’t stop thinking of the figure. So, I decided to sell off a bunch of toys and contacted a dealer in Japan to see if the figure was still there for sale. Luckily, it was and they helped me to purchase it. Because the figure is fragile and expensive, I requested that they carefully wrap and pack the figure in a sturdy box and declare the full insurance amount when shipping it. I waited what seemed like weeks for the figure to arrive. To my complete horror, the mailman handed me a shoe box that was partially opened, and inside the figure was barely wrapped in one piece of newspaper! I quickly examined the figure to make sure it was not broken and luckily it was in perfect condition. As I was throwing out the box, I glanced at the shipping label and once again was shocked to see that the declared insurance value was $5.00, not the value of $5,000! The story has a happy ending, but to this day I keep thinking of how lucky I was that it made it to me in one piece! JANM: Where was the most unique place you bought a kaiju toy? MN: Not really the most unique place, but I think using a fax machine to order toys from Japan was unique. Before email and the internet (yes, that long ago) I would buy toys via the fax machine. A dealer from Japan would fax me in the middle of the night (it was his daytime) with various toy offers. The next day I would circle what I wanted and fax it back to him. I’d still have to wait for another fax to me with payment information. Once I got the totals I had to get a postal money order and mail the payment to him. I’d wait a month for a box to arrive and sometimes a toy would be sold out by the time he got payment. In that case, I would end up with a credit with the dealer. There was much more work involved to obtain Japanese toys back in those days. Now, with the internet, toy buyers can get a ”fix“ instantly. To me, the fun has been taken out of the searching and hunting process for these toys. JANM: What is your favorite piece featured in the exhibition? MN: I know I will get asked this question and to be honest it’s like picking your favorite child! In no particular order for the heroes: the Bullmark Red Ultraman figure, Marusan Talking Ultraman figure, and Ultraman costume. For kaiju figures, I would say the glow in the dark Bullmark Zazan figure, Bandai Barom One Doruge figure, and Bullmark Mirrorman Darklon figure. Join Mark Nagata on Saturday, September 15, at 2:00 p.m., for a conversation with Marusan toy company President Eiji Kaminaga about kaiju toy history, the world of Japanese toy collecting, and their companies’ histories. (The Marusan toy company created some of the first vinyl kaiju and hero toys of the 1960s and these toys make up a significant part of Nagata’s collection). The conversation will be moderated by Brad Warner, who worked for 15 years at Tsuburaya Productions, the makers of the Ultraman television shows. Following the discussion, Mark Nagata will sign copies of Toy Karma, an accompanying book by and about Nagata, as well as a 13″ x 19″ print (10″ x 17″ image size) featuring a kaiju and hero image by toy photographer Brian McCarty, who will also be signing the print. The book is $24.95 and the print is $50. Both can be purchased the day of the event. RSVP here. 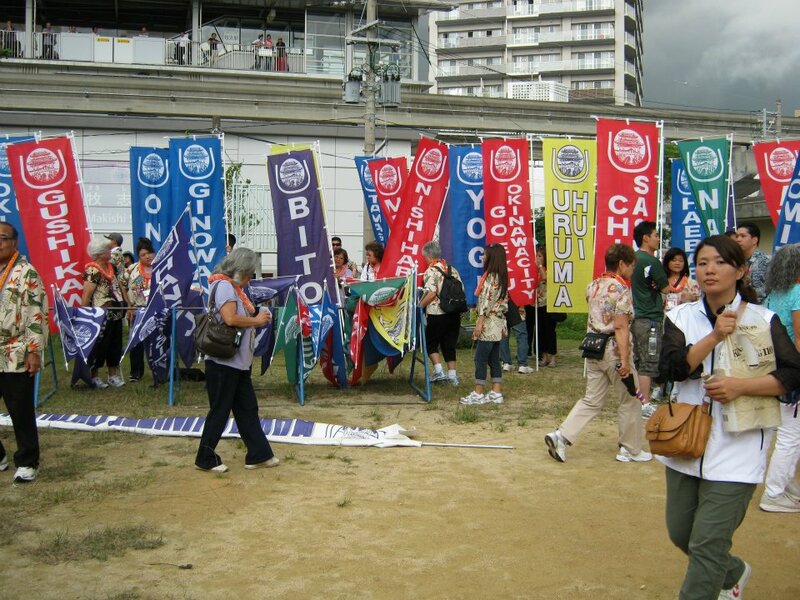 every five years by the Okinawan government, people of Okinawan descent from all over the world come home for a week of activities and socializing. On July 11, JANM will open a new exhibition, Sugar/Islands: Finding Okinawa in Hawai‘i—The Art of Laura Kina and Emily Hanako Momohara. The two artists in the exhibition examine their mixed-heritage roots in Okinawa and Hawai‘i, drawing heavily from ancestral histories. The opening day will coincide with a JANM Free Family Day, which will feature many crafts and activities inspired by Okinawan culture. Although it is currently part of Japan, Okinawa for most of its history was an independent island kingdom called Ryukyu. Because of its location between the Pacific Ocean and the East China Sea, sailors, traders, scholars, and travelers from Southeast Asia, China, Korea, Japan, and beyond visited the Ryukyu Kingdom. Over time, elements of the languages, arts, and traditions from those countries found their way into the Ryukyuan culture, enriching it and making it even more distinct from its neighbors. In the Okinawan language (Uchinaaguchi), this mixing of cultural influences is called champuru. 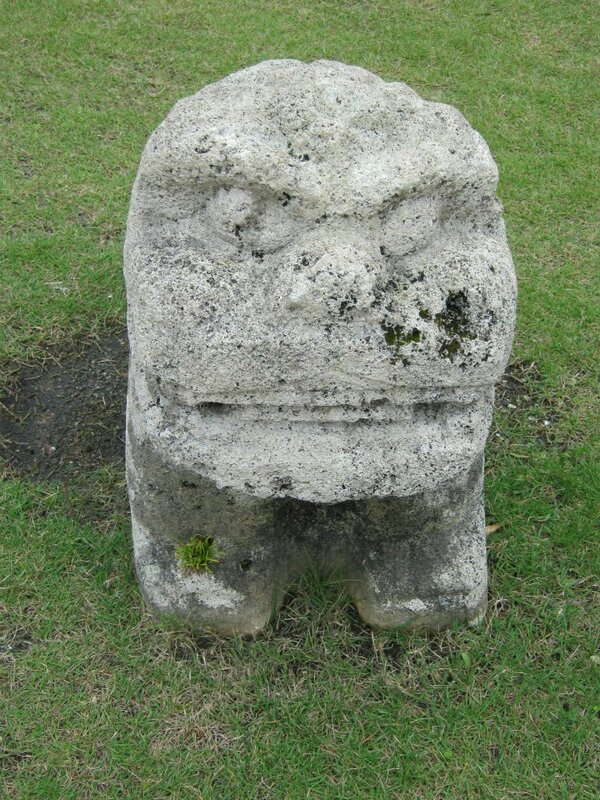 A traditional shiisaa (lion/dog) stands guard in Okinawa. Photo: Allyson Nakamoto. In 1609, the kingdom was annexed by Japan. Trading continued under the banner of Japan, while the Ryukyuan court system, performing arts, literature, and crafts flourished. In 1879 however, Japan officially took over the kingdom and renamed it “Okinawa Prefecture,” dissolving the Ryukyuan monarchy. The Japanese government then attempted to eliminate Ryukyu’s native culture, replacing it with Japanese language, culture, and laws. A variety of factors tied to changing social policy in Okinawa soon led to economic hardship and social unrest. At the same time, the Chinese Exclusion Act of 1882 created a need for more immigrant labor in the United States. In 1899, the first group of laborers left Okinawa for Hawai‘i. Emigration then began in earnest from Okinawa to Hawai‘i, to the mainland United States, and to South America. 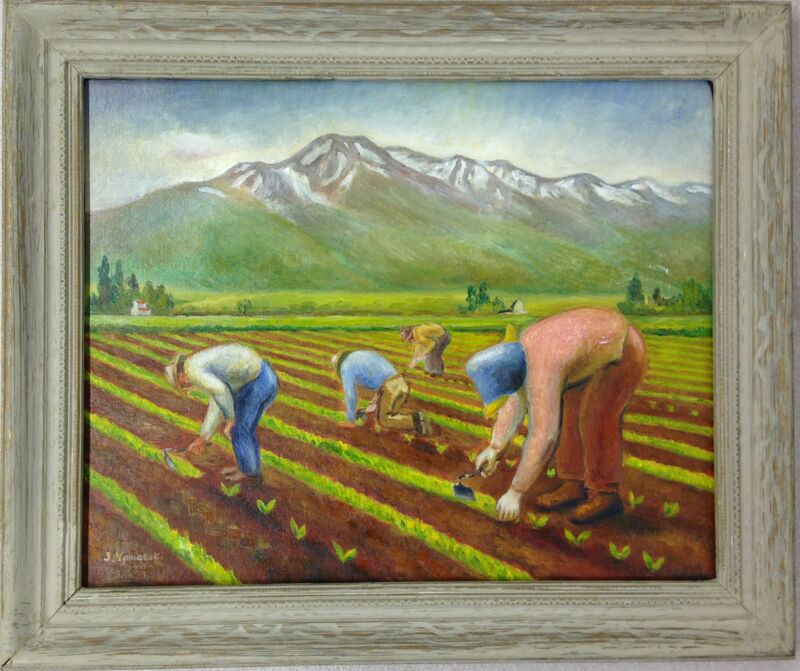 It is the history of these immigrants that is explored in the art of Laura Kina and Emily Hanako Momohara. How did the former Ryukyuans make their lives in Hawai‘i? How did their culture continue to evolve in Hawai‘i, mixing with even more cultures? Despite all this champuru, there is still something that is distinctively and identifiably Okinawan. Little Tokyo is filled with public art, from street murals to commemorative statues. 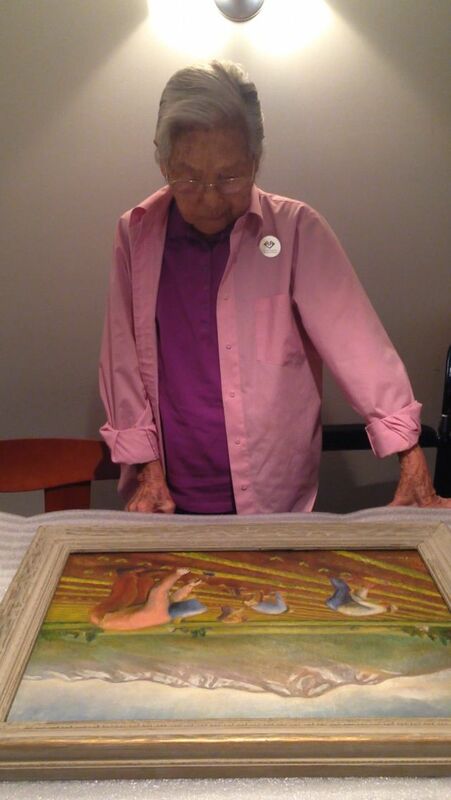 JANM Development Assistant Esther Shin explores one of those works. Toyo Miyatake’s Camera, a public artwork by Nobuho Nagasawa. Photo: Esther Shin. Toyo Miyatake’s Camera, a bronze sculpture by artist Nobuho Nagasawa, stands just outside of JANM’s Historic Building. 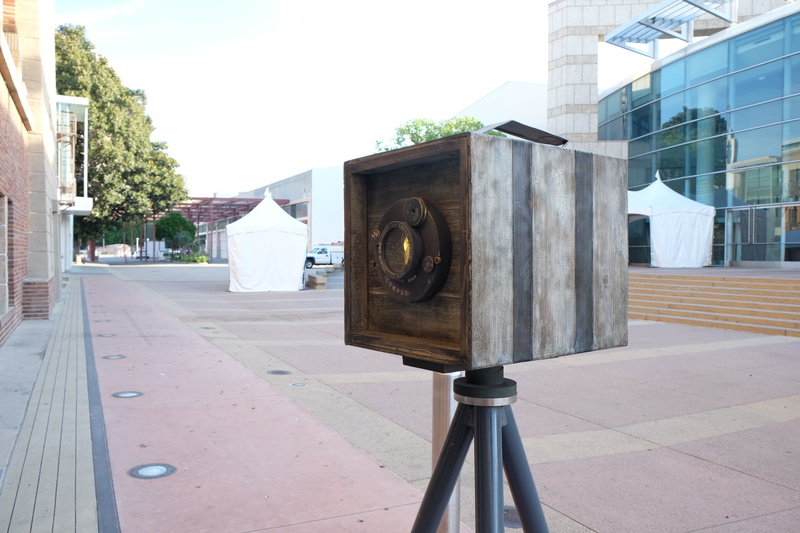 Made in 1993, it is an outsized replica of an actual camera that belonged to the Japanese American photographer. In the evening, the camera projects slides of Miyatake’s photography onto a window of the Historic Building. Toyo Miyatake established a photo studio in Little Tokyo in 1923. He became known for his photographs documenting the early Japanese American community. During World War II, Miyatake was imprisoned at the Manzanar incarceration camp along with 10,000 other Japanese Americans. He had to leave behind his home and studio, but he managed to smuggle a camera lens into the camp and constructed a camera body from wood. With this camera he secretly documented the community’s daily life behind barbed wire; the photographs from this period have become important documents of this tragic episode in American history. 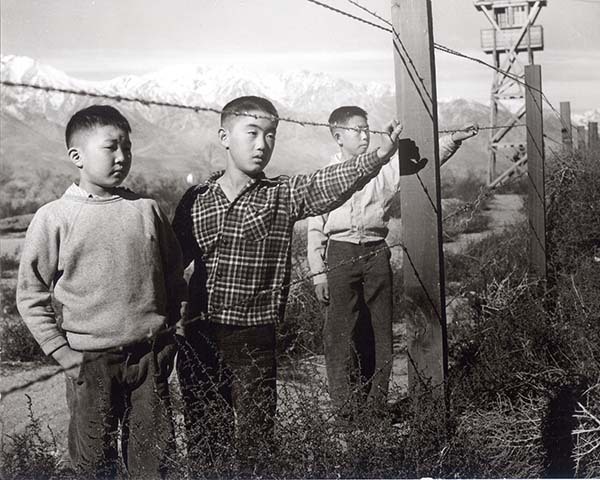 A well-known photograph by Toyo Miyatake, taken at Manzanar concentration camp. Courtesy Alan Miyatake, Toyo Miyatake Studio. Nagasawa’s sculpture is my favorite public artwork in Little Tokyo. Although it is relatively small and modest, it speaks loudly and is rich in meaning. 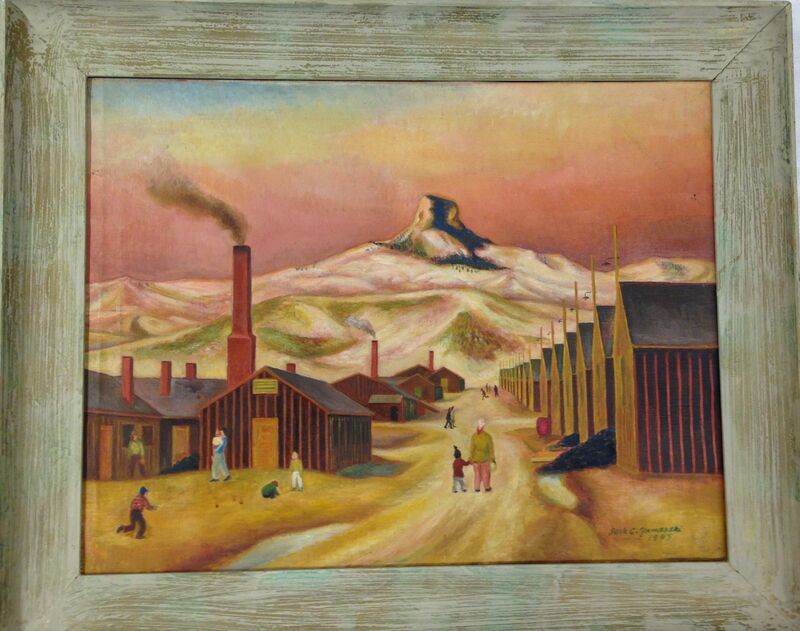 I see it as a symbol of remembrance, underscoring the importance of looking back and reflecting on what has happened in the Japanese American community—not only during the incarceration of U.S. citizens during WWII, but in the years before as well. I appreciate the fact that the images projected by the installation include darker moments from our history alongside special events and celebrations that were dear to the community before the war—such as the 1932 Summer Olympic Games in Los Angeles, and the Nisei Week parade of 1939—because all of these moments, bright or dark, are part of the Japanese American story. It is fitting that the sculpture is located on the plaza of the museum, and faces the Historic Building. It stands on the spot of a former WWII reporting site, where hundreds of Japanese Americans boarded buses to be taken to incarceration camps. It is also located across the way from JANM’s Pavilion building, where the permanent exhibition, Common Ground: The Heart of Community—which chronicles 130 years of Japanese American history—is displayed. To explore more works of public art in Little Tokyo, sign up for JANM’s Edible Adventures: Public Art and the Sweets of Little Tokyo tour on March 28. Lisa See’s bestselling novels—which have included Shanghai Girls, Dreams of Joy, and Snow Flower and the Secret Fan—are known for telling compelling stories of human relationships set against the rich backdrop of Chinese and Chinese American history. Her latest novel, released last June, is no different. Set in San Francisco on the eve of World War II, China Dolls follows three independent young women as they revel in the city’s exciting and glamorous Chinatown nightclub scene. The women become close friends, sharing secrets and supporting one another through struggles and triumphs. When the Japanese bomb Pearl Harbor however, it sets in motion a chain of events that threatens to change their lives forever. 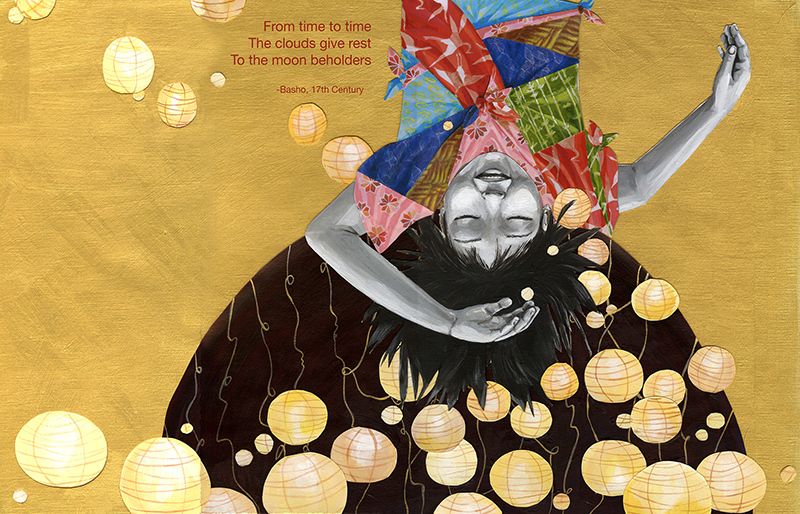 One of the remarkable things about China Dolls is that it captures some key connections between Chinese American and Japanese American experiences. As in much of her work, See draws on her own family’s history to weave some of China Dolls’ narrative. During World War II, See’s grandparents lived in and took care of the home of the Oki family while they were imprisoned in camp. While many Japanese Americans lost everything after the war, the Oki family was able to return to their home and their belongings. 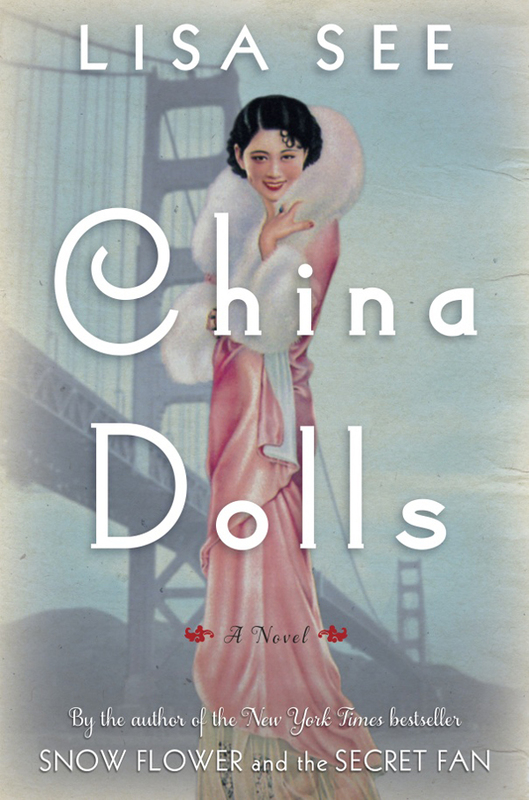 In China Dolls, the incarceration of Japanese Americans plays a major role in the book, with vivid passages describing life in the camps. Hideo Date, Where South and North Winds Meet, ca. 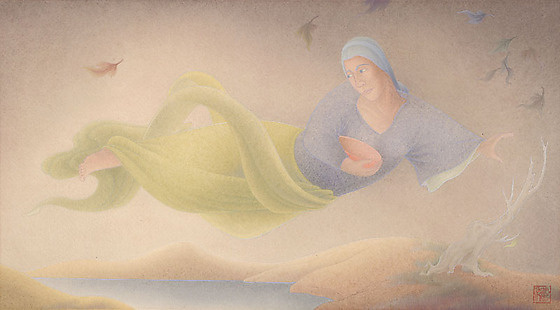 1940, watercolor and gouache on paper. Japanese American National Museum. Gift of Hideo Date. 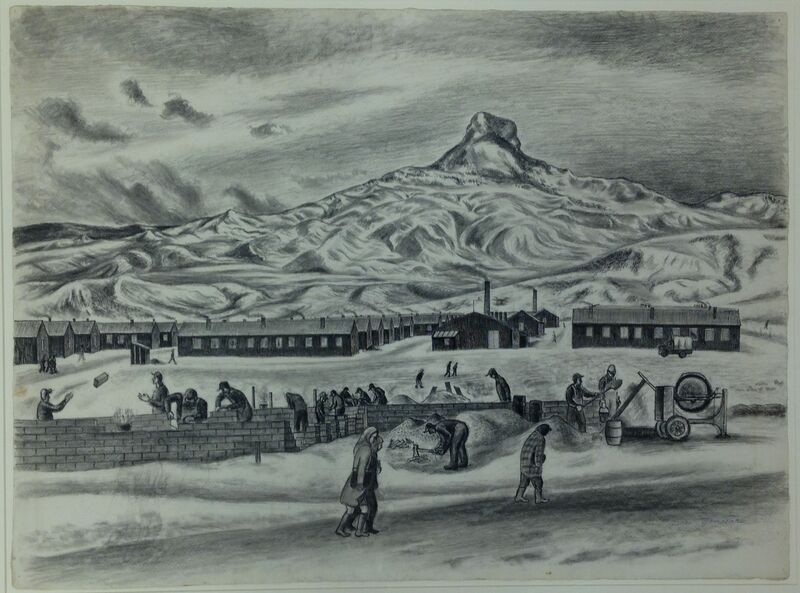 See’s family history intersected with Japanese American history in other significant ways. In 1935, Eddy and Stella See (Lisa’s grandparents) opened the Dragon’s Den restaurant in the basement of the F. Suie One Company, located in Los Angeles’ original Chinatown. Eddy See commissioned three artists, including his good friend Benji Okubo, to paint murals of mythical Asian figures like the Eight Immortals on the restaurant’s exposed brick walls. See had already been selling artworks by all his friends in a small gallery in the mezzanine. These included works by Okubo, Hideo Date, and Tyrus Wong, who went on to become an influential graphic artist after creating the signature look for Disney’s Bambi movie. 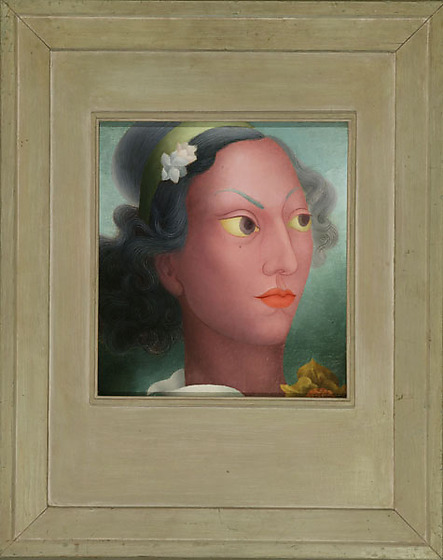 Benji Okubo, Portrait of Sissee See, c. 1927–45. Japanese American National Museum. This Saturday, January 31, Lisa See will be at JANM to discuss China Dolls and her family’s connections to Japanese American history. She will also take questions from the audience. China Dolls can be purchased from the JANM Store and online at janmstore.com. For a more in-depth profile of the author, check out this new feature story on Discover Nikkei.